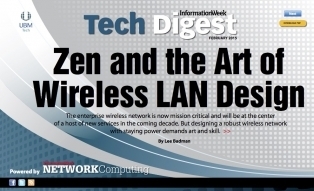 This is Network Computing's February Tech Digest on wireless LAN design. Access is free with registration in the InformationWeek community. Just register below. There's no cost, and it takes only a few minutes. Once done, click the "Go To Digital Issue" button at the bottom of the page. Zen and the Art of Wireless LAN Design: The enterprise wireless network is now mission critical and will be at the center of a host of new services in the coming decade. But designing a robust wireless network with staying power demands art and skill.